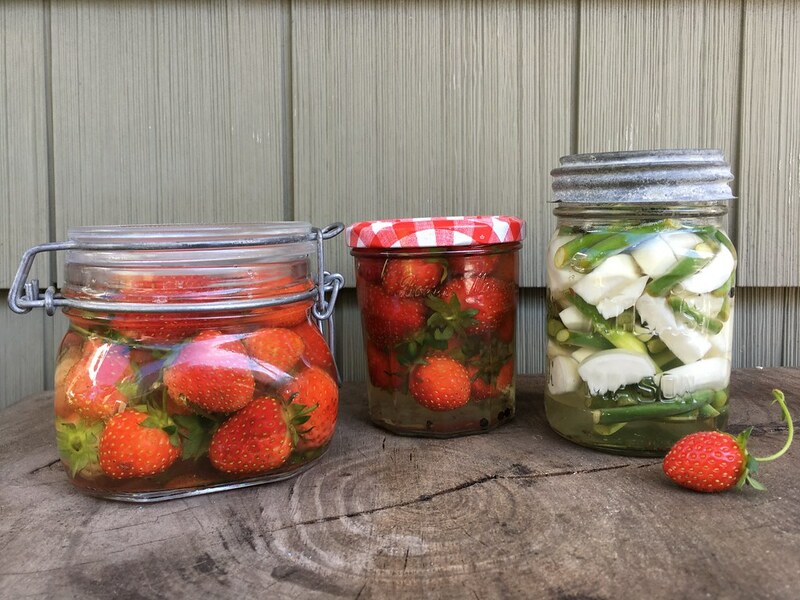 Quick pickling (or "quickling" if you want to say it as speedily as you make it) is an easy way to use a glut of produce, and it doesn’t require any special canning equipment. A variety of vegetables or even fruits can be used by themselves or in combination. The spices may also be varied—just be mindful of how their flavors may influence each other. Really, the combinations are endless! 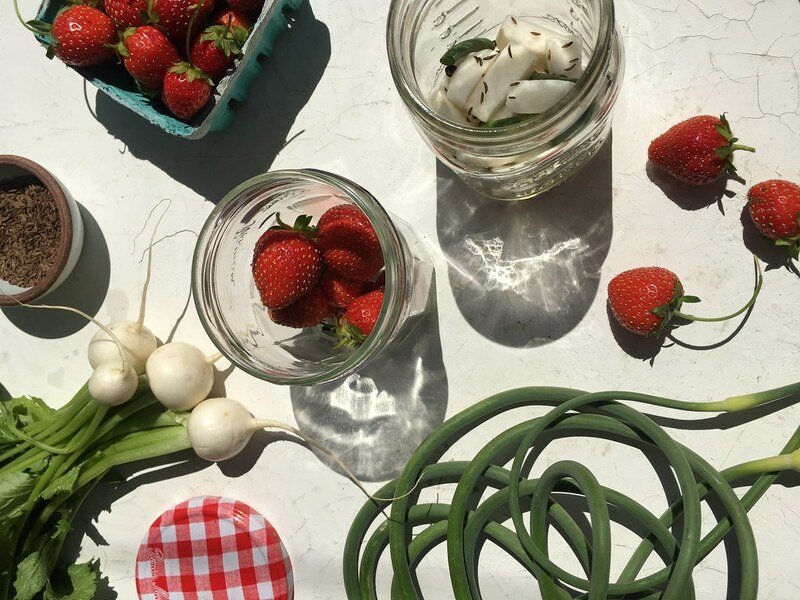 Local strawberries are among my favorite things to pickle. Their flavor is more complex than those grown in hothouses, but their shelf life is much shorter. You can use the same pickling recipe for any soft fruit, such as mulberries, blackberries, or blueberries. Just make sure the brine is cool before pouring it over the fruit to avoid a mushy pickle. The amount of liquid needed will fluctuate according to your choices, but the following recipe is a general guide for a one-quart jar of pickles. 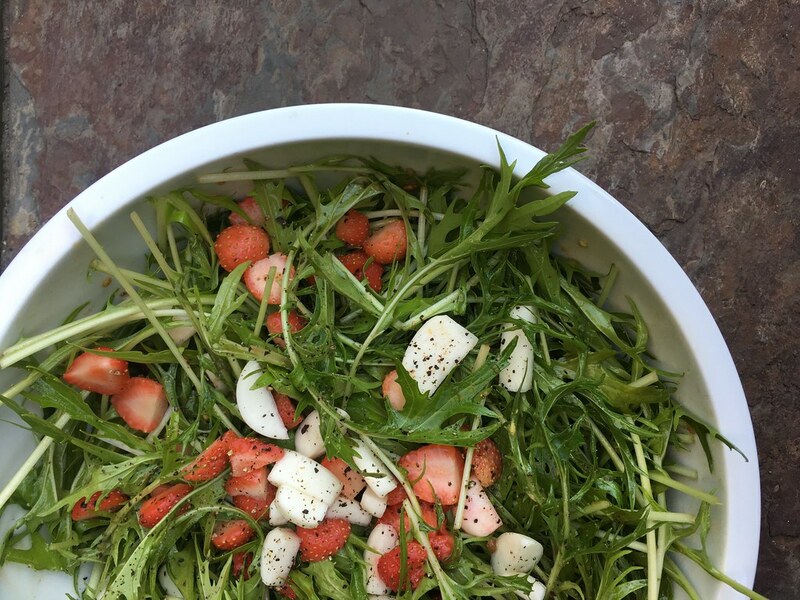 Place the strawberries or other fruit into a clean jar, alternately sprinkling in the caraway and black pepper as you go. Make the brine: Warm the vinegar, water, sugar or honey, and salt in a small saucepan over medium-low heat, stirring occasionally. Once the ingredients have fully dissolved, allow the brine to cool completely before pouring over the fruit. Let the pickles sit for about an hour before serving. The longer they brine, the more saturated and intense the seasonings will become. The pickled fruit should be eaten within a day. To make vegetable pickles (such as the Hakurei turnips featured in the photos), use the recipe above, but include only half the amount of honey or sugar to create a more savory brine. You can also add 2 to 3 peeled whole cloves of garlic and, if you like, a hot pepper to the vegetables, herbs, and spices, depending on your vegetable choice and preference. Slice, julienne, or mandoline the veggies to uniform thickness. The thicker you cut them, the crunchier they will be. Pack the cut veggies, herbs, spices, pepper (split open), and garlic into the jar. Make the brine and pour immediately over the vegetables while still hot. Let the pickles sit for at least an hour before serving. The vegetables will keep for up to three months in the refrigerator. Note: You can reuse the brine by adding more fruit or vegetables to the jar. The brine is also wonderful mixed into salad dressings or in vodka martinis garnished with pickled fruit.